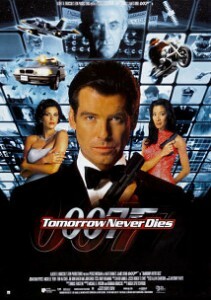 Bond is back, and Pierce Brosnan is on for a second go. This is one of my favorites, despite what anyone else might say. It does have its weaknesses, tho, and I explore both its strengths and failings right along. I love the action, the addition of Wai-Lin, the music, and more. I don’t care for Elliott Carver’s plan all that much. I’m watching an HD version off a movie channel, so hopefully it will sync with the new Blu-ray. Start the commentary after the MGM lion and United Artists logo with the gun-barrel sequence, on the countdown.